I'd appreciate if anyone can take the time and provide advice base on their experiences on how I should go about in investigating what is causing the symptoms I have been experiencing. It's a long read so please bear with me. I don't have any diagnosis yet but for the past 8 mos. I have been dealing with several neurological/constellation of symptoms. I am 36 yo. male and prior to Mar 2018, my diet has been high red meat, high carbohydrates, low vegetables. After Mar 2018, I changed to high vegetables and fish, medium serving of carbohydrates, less red meat, gluten free, high in good fats (e.g. olive oil, avocado). Before 2018, I have experienced below symptoms and were largely blamed to either stress, getting older, getting tired, or other common cause. Wrists and and ankles gets tired/sore/weak easily and felt that resting relieves the soreness/weakness. Recurrent cough without phlegm and recurrent sore throat but doctor's would say my lungs are clear after. Shortness of breath that seems to happen at the same time as the cough and sore throat. Doctors would prescribed cough syrup and antibiotics which normally I would not take unless I felt I really needed to. Itching that moves around the body and comes and goes. It happens 2 to 3 times a week. Ice pack would help relieve the itchiness. On 2016, I had high fever, body aches, cough without phlegm, conjunctivitis (there were swelling around the eyes thus GP diagnosed as such) and was prescribed antibiotic. This lasted for about a week and a half. After this, I just felt my eyes were not as clear as before (i.e. blurry). On Mar 2018, swelling of the left ankle that lasted for a week. Unable to walk for 2 days and later was diagnosed as gout and took colchicine for it. GP initially thought was due to infection thus was sent to ER. X-ray of the ankle revealed no fractures. Went to rheumatologist who mentioned that it sounded like gout but will not be able to accurately diagnose without fluid taken from the joint. d. Sharp nerve pain on the left shoulder blades that seem to originate from spine and goes to the head and radiates down to the left leg. h. Sharp pain in the lower back and feels like the nerves exiting the spine are inflamed. The pain seems to pulsates at times. i. Sharp and dull pain in the spine which felt like my spine was inflamed. The pain comes and goes and it is usually felt in the middle part of the back and sometimes at the lower part or bottom. a. Forgetfulness, confusion, brain fog that comes and goes. I experience this together with the headach/head pressure. s. Cramps/spasms/twitching that randonly happen around the body. a1. Sharp pain in the joints (e.g. knees, elboss, finger joints). I can't seem to determine if it is due to nerves, spasms or just joint pain. a. Headache with head pressure coupled with dizziness and brain fog that happens almost everyday. b. Cramps/spasms/twitching that randonly happen around the body. c. Feels like droplets of cold water running under the skin that comes and goes and is felt all over the body (e.g. top of the head, arms, legs, shoulders, back). Sometimes I feel it mostly in the left side, but I also experience it in the right. d. Sore throat/feeling of something stuck in my throat that comes and goes but happens almost everyday. e. Blurry vision that comes and goes and happens almost everyday. f. The body parts where I experienced numbness before (e.g. right big toe, upper left abdomen), nowadays I would feel dull pain that comes and goes. I have been to GPs, rheumatologist, and neurologist and have been told that what I'm experiencing is all in my head. The neurologist that I saw mentioned in her website that her specialties includes "Neuroimmunological conditions including multiple sclerosis". The neurologist was suggesting I have functional neurological disorder (FND http://www.neurosymptoms.org/) which I don't particularly agree. She suggested this on our first appointment without closely reviewing my brain MRI and without ordering MRI of the neck and spine. She was even rushing through the neurological tests. I have been seeing a team of medical practitioners that consists of a integrative GP, naturopath and nurse. they are the only ones who are interested in helping me find the root cause. Unfortunately, they are also stumped. I was prescribed mirtazapine for vertigo. The mirtazapine helped with my sleep (8-9hrs) but I have now weaned off of it. After stopping mirtazapine, I have only been sleeping for 6hrs mostly. I just finished Nilstat and Toxaprevent. a. advise how I should proceed further in investigating the root cause? b. name/contact of doctors/specialists who can help me (I am living in Sydney so it would be great if the doctor is in Sydney)? c. advise how I can improve my condition through diet, supplements, etc (Let me know any specific test result you would like to know.)? hi and welcome. can you elaborate re several blood tests? A test for inborn errors of metabolism in which organic acids can build up in the body and are then found in elevated quantities in the urine. Though these conditions can present with developmental delays, there are other features as well that usually lead to the ordering of this and similar tests. This patient had none of the hallmarks of an inborn error of metabolism. Of note, this test was performed by The Great Plains Laboratory, Inc., which is used widely by sCAM providers to support bogus diagnoses. It comes complete with unsupported interpretations of test results, and suggestions for the corresponding dietary supplements." The patient is labeled with fictitious and typically multiple diagnoses. Some of these may be real conditions, though the patient does not usually have any of them. Others may be pulled from the sCAMer’s grab-bag of fake, alternative diseases. A multitude of lab tests are ordered. With a stretch of the imagination some of these tests may make sense based on the patient’s complaints, though they are often repeats of tests already performed by the patient’s real health care provider. Usually the tests ordered are completely unwarranted, and are performed with what we call a “shot-gun” approach. That is, the provider blindly orders tests in the hope that something will come up abnormal. This is a dangerous approach that is sure to turn up out-of-range values with no clinical significance, leading the provider to order more tests and possibly make erroneous diagnostic conclusions. The manner in which these providers order lab tests demonstrates a complete lack of clinical insight at best. At worst, it is fraud. Genova Diagnostics and Metametrix Clinical Laboratory. After suing each other over who has the rights to run which bogus tests, these two giants of sCAM have now merged into one pseudo-science behemoth. Unnecessary or potentially dangerous treatment recommendations are made (see above). Invariably, some form of pseudoscience-based treatment regimen is foisted upon the credulous sCAM patient or their parent. This often comes in the form of a dietary supplement – either an herbal, homeopathic, vitamin, mineral, or biologic (amino acid, neurotransmitter) product. Sometimes the product is a proprietary concoction, obtainable only through that office. Either way, many sCAM providers have an on-site or web-based store through which their patients can purchase the recommended treatments." lol spectra cell i've read a few of their pages for sure. Why are you taking lavender oil? There has been some evidence that lavender essential oil may be an endocrine disrupter and activate estrogen receptors. @NHE, I was checking if it helps with improving my sleep. I can't seem to find the study that I read which prompted me to consider it. I'll post back once I find it. Anyway, my sleep has been horrible lately. I have no issue falling asleep in the evening but once I wake up which is usually after 6hrs of falling asleep, I will not be able to sleep again. @jimmylegs, now I feel sCAMed . I am quite desperate to find out what's causing my symptoms as it is affecting my life and work. Even at this moment, I am at work, it's quite difficult to focus and think and that's why I thought of reaching out to more people who have experience and done a ton of research already like you guys. My blood test results are scanned copies. It's best to show it to you rather than typing them here as there are alot of tests that they did. I'll figure out how to post the scanned copies here. oddbuds wrote: @NHE, I was checking if it helps with improving my sleep. I can't seem to find the study that I read which prompted me to consider it. I'll post back once I find it. Anyway, my sleep has been horrible lately. I have no issue falling asleep in the evening but once I wake up which is usually after 6hrs of falling asleep, I will not be able to sleep again. Some people have reported good sleep effects with CBD oil, but the melatonin and GABA cost a whole lot less. The more I read of your symptoms the more I thought "an infection". What did the blood tests look for? Did they look for mycoplasmas, rickettsias or any specific bugs? Have you traveled anywhere exotic in the 2 years prior to these symptoms emerging? Your shortness of breath also made me think you should get an ENT surgeon to look straight up your nose to see if you have a deviated septum. Do you still have your tonsils? A blocked nose and rotten tonsils will cause that sort of cough if you are a mouth breather (speaking from experience here). I certainly don't believe its all in your head. "a. advise how I should proceed further in investigating the root cause?" try other doctors. Since you seem to suspect MS, find a neurologist that specializes in MS.
"c. advise how I can improve my condition through diet, supplements, etc (Let me know any specific test result you would like to know.)?" I liked much of your diet prior to Mar 2018. But feel it could be improved upon with a couple of minor changes. and follow a diet which is basically a gluten free, sugar free, and high in good omega 3 fats (meats from grass fed animals ONLY and WILD caught seafood, nothing farm raised). Veggies are optional and you get the best nutrition and health benefits if you grow them yourself indoors. Although Australia is known for its exceptional grass fed meats (which I consume a lot of as one of my local supermarkets imports a lot of meat from there), not all of the meat in Australia is grass fed so shop very carefully. Since you state your new diet has foods high in good fats, I suggest you research what types of fats the foods you are consuming have and what is a 'good' fat (hint: Omega 3 fats). Although Olive Oil is considered 'healthy' by most, olive oil is not heart–healthy and not as healthy as most think. Yes, foods rich in monounsaturated fats like olive oil may be better than foods full of saturated and trans fats, but just because something is “better” does not mean it is good for you. Choose your fats wisely - Omega 3 is the way to go. "I changed to high vegetables and fish"
Modern vegetables have little nutrition and have other health concerns. Fish and seafood, if wild caught, are an excellent choice. By the way, you may be surprised to find out that grass fed meats and wild caught fatty fish like salmon and tuna are all high in good omega 3 fats. Keep in mind that there is not one diet that has been 'proven to work' but all diets seem to work for some and not for others. Low fat diets and high fat diets both work (for some). What I have outlined works well for me. Since you have changed your diet, have you noticed any difference in how you feel? Last edited by ElliotB on Fri Dec 07, 2018 7:16 am, edited 1 time in total. jimmylegs wrote: hi and welcome. can you elaborate re several blood tests? Thanks NHE. I'll try it out. The naturopath recommended me to try MG OPTIMA™ RELAX but did not see improvement with sleep duration. Scott1 wrote: The more I read of your symptoms the more I thought "an infection". 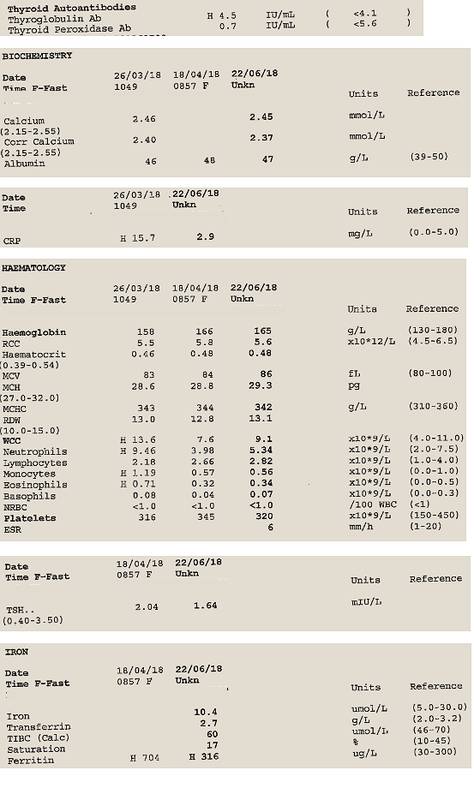 What did the blood tests look for? Did they look for mycoplasmas, rickettsias or any specific bugs? Have you traveled anywhere exotic in the 2 years prior to these symptoms emerging? Some of the bugs you mentioned I believe are included in my most recent blood tests which I would get a hold of by next week. I was in Singapore when some of the symptoms started emerging. I also worked in Minnesota US for 14mos but that was 10+ years ago. and have spent a lot of weekends outdoors. I even went camping for one night near Wisconsin. In my view, I agree that infection is a possible cause. Scott1 wrote: Your shortness of breath also made me think you should get an ENT surgeon to look straight up your nose to see if you have a deviated septum. .
With regards to shortness of breath, there was an episode where I felt the nerves going to my lungs are inflammed and the pain is pulsating. I rarely get this issue now. Scott1 wrote: Do you still have your tonsils? A blocked nose and rotten tonsils will cause that sort of cough if you are a mouth breather (speaking from experience here). Yup, I still have my tonsils. I did have recurrent issues with blocked nose and sore throat. Thanks. What are the contents of The Natural Relaxant Tablets. I can't seem to find the list from the link provided. ElliotB wrote: try other doctors. Since you seem to suspect MS, find a neurologist that specializes in MS.
Yup, I'm searching for a new neurologist. I am having difficulty finding one as I'm looking for recommendations from other people. I can google neurologists in sydney that specializes in MS but could end up with the same doctor as my current one. ElliotB wrote: Since you have changed your diet, have you noticed any difference in how you feel? Well, after changing my diets, when I have colds, it seems shorter and less severe? Actually, I started to increase meat in my diet and added back eggs (free range). I eat grass fed organic beef. On that last issue, maybe get the ENT man to look at your tonsils as well as why your nose is blocked. It does make a big difference. Unfortunately, we are talking about surgery and I expect you will damn me to hell if you have to go through with it. Only an ENT surgeon can make the call. GPs generally are not up to speed. If it required, its not an MS issue. More likely, its bad luck. I had my tonsils out when I was 40 and my septum unblocked about 18 months earlier. None of it is pleasant but I'm glad I did it. Formula 303 Natural Relaxant has 3 all natural ingredients, Valerian root, passiflora, and magnesium carbonate. Valerian Root: Derived from a herb that is primarily used to treat sleeping disorders, specifically insomnia. It works as a sedative that calms the brain and nervous system, therefore relieving anxiety or stress that may be keeping the user up. Passiflora: A flower whose above ground parts are used to make medicine. It can treat several different symptoms and has many uses, but is mostly used to treat sleep problems. The chemicals within the plant are calming and can induce sleep while also relaxing muscles and preventing them from spasming. Magnesium Carbonate: A mineral that is primarily used to treat users who have a low amount of magnesium in their blood. A healthy amount of magnesium is key for proper function of the heart, bones, nerves, and cells. This product seems to have very good to excellent reviews on numerous sites on the web, including over 1600 reviews on Amazon alone with a 4.5 star (out of 5 rating). I have been using it for about 9 months. I only take 2 tablets before I go to sleep, the recommended dosages are typically higher depending on what you are taking it for. Apparently it works for muscle spasms and stress as well. It definitely works for me. It is relatively inexpensive and worth a try if you have sleep issues, muscle spasms and/or stress. Your 25-OH Vitamin D level in Mar & Apr 2018 was 65 nmol/L (your lab's reference range: 50-140 nmol/L). This is the equivalent of 26 ng/mL which is frankly deficient in my lab's reference range of 30-100 ng/mL. Discuss with your doctor the possible benefits of raising your vitamin D level to the top of the range with supplements. ok lots going on here, not simplistic. i'm not any kind of pro. just know about a few nutrients and how they interact with a few other goings-on. b12 looks good in pmol/l, and the MCV, MCHC back up good status from the haem perspective at least. high cholesterol, highish triglycerides, i'll read back to check if you've been working on those to any extent already. re d3, 65 is insufficiency. 75 bottom end of desirable. other lit IDs 90-100 nmol/l as the best bet for a *limited* array of outcomes. some work IDs 150 nmol/l as a good zone and any higher leading to more problems in certain groups. the research is finally starting to get into interactions to a greater degree, ignorance of which over the years has been and apparently continues to be a pet peeve of mine. Mg status could definitely be better; could be worth the effort to push that up to at least 0.95 mmol/l. I’m 62, female and active. I’m new and undiagnosed but am here looking for some answers and support. Hi Thank you all for your replies and I will certainly mention all this to my Dr.